Beautiful Organic Turquoise Cabochon & Little Bee Necklace, Turquoise is set into a handcrafted sterling silver & Copper setting with little sterling silver Bee charm both exclusive JBJ and the only one made so its One of a Kind. 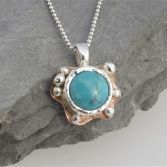 This large 10.0 mm Turquoise cabochon is a beautiful colour and is set into an organic unusual setting with sterling silver balls. 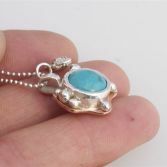 The necklace measures its size is 20.0 mm wide by 22.0mm long. 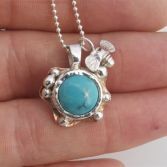 It is hung on a solid sterling silver ball chain with balls that measure 1.2 mm in diameters. 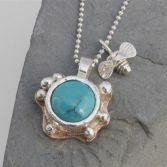 The chain can be ordered in two lengths 16 inches, 18 inch or 20 inches long. 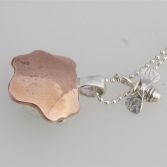 The Little Bee charm can be taken off so its up to you how you wear it. 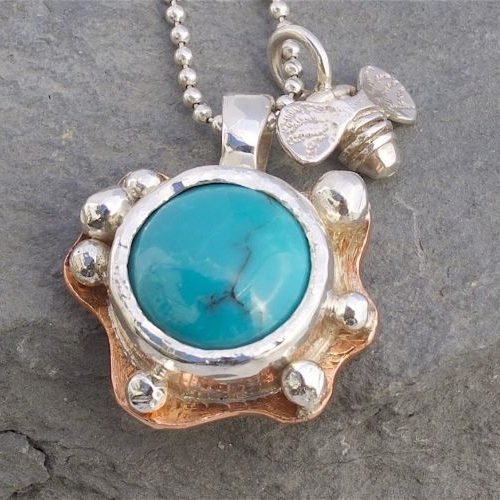 The Turquoise Cabochon & Little Bee Necklace will be presented in one of my signature gift boxes and posted via Royal Mail 1st class signed for delivery to any UK address free of charge.